Leprosy patient escaped.—This past Tuesday, Dr. Hoffman [Kauka Hopemana] went to see the leprosy patients at the hospital in Kalihi. When he arrived, he was told that one of the patients escaped, and ran away, and it is not known where he is hiding. It is thought that he boarded the Kilauea on Monday evening, but if that is not the case, where could he have gone. It would be best if he is returned within his confines should he be found, or he will be lost, and that will be very dangerous. 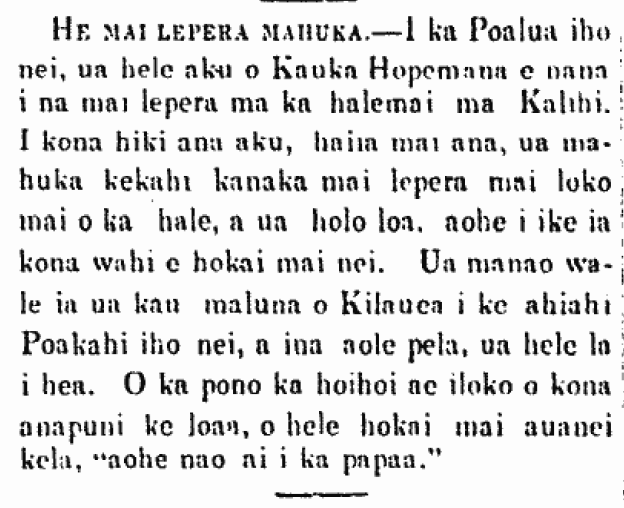 Ka Nupepa Kuokoa, Buke VI, Helu 15, Aoao 2. Aperila 13, 1867. The sound of the firecrackers of the Chinese was deafening. and Ulakoheo was festive with the din of the sound of the corrugated iron [? pa piula] of their Band. When you look, their ears are enjoying the joyous strains of the instruments that sound like the squeal of the block of the ship Kilauea, when it encounters sudden gusts of winds outside of Mahukona and those places. The Chinese New Year [konohi] yesterday was a day of much fun for them, and they are wishing a happy new year these days. 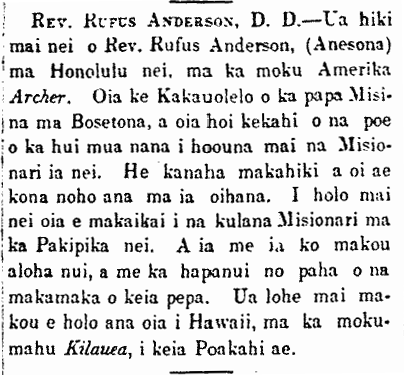 Ka Lahui Hawaii, Buke II, Helu 5, Aoao 3. 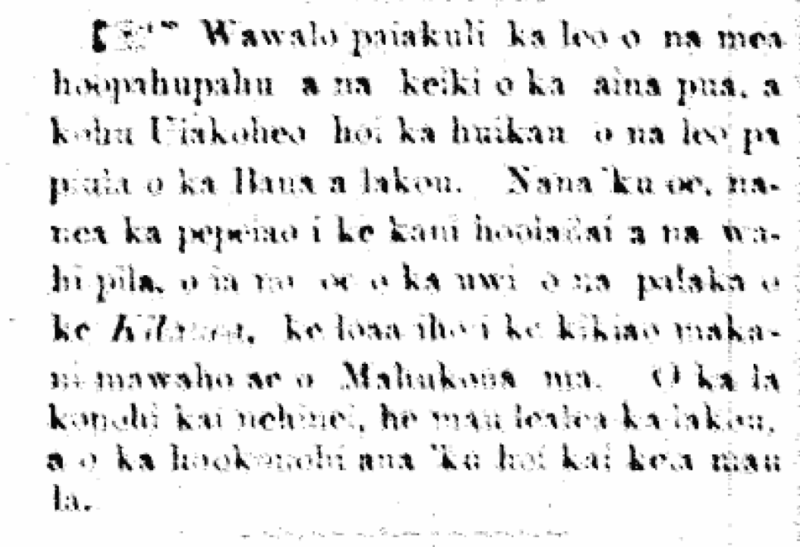 Ianuari 27, 1876.